Many of us will face an injury at some point in our lives. 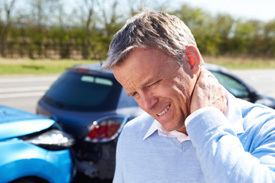 Whether it’s in an automobile accident or as a result of an accident at work, you’ll want to make sure you get the proper care for your injury as early as possible to keep it from becoming a bigger problem later. Sometimes you’ll have a fall or some other event that leads to a seemingly minor injury. You may even feel no pain. But evaluation and treatment of any possible injury is important to minimize problems it might cause you later in life. When you first begin care for an injury, we’ll help you coordinate any coverage through insurance or workman’s compensation. We want to make it as painless as possible for you. We’ll see you more frequently in the beginning, while we help you get past the initial injury. As you improve and become stronger, we’ll see you less frequently. We’ll reassess your condition every four weeks, as needed. Then, you can choose to continue with wellness care to maintain your good health.